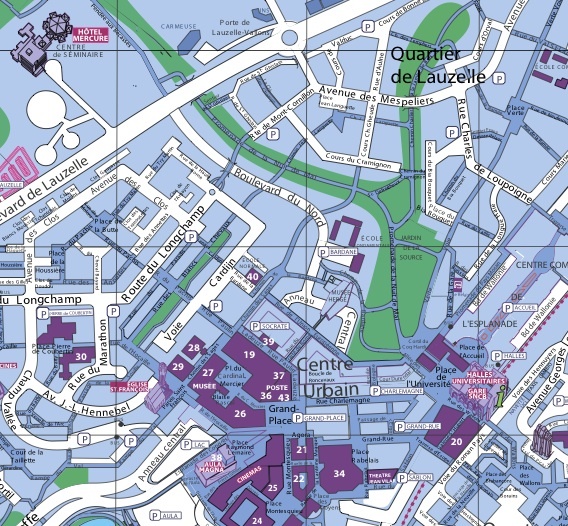 How to get to ERSA office at UCL – Louvain-la-Neuve? ERSA office is located 100m from Louvain-la-Neuve train station (Building 20 on the map). From one of the railway stations, ask for a ticket to “Louvain-la-Neuve Université” (NOT Louvain or Leuven) and take the Brussels Ottignies-Namur-Luxembourg line (trains every half hour). Get off at Ottignies and continue to Louvain-la-Neuve by train (about 8 min.) or by taxi (cost approximately 10 Euros). Some trains go straight from Brussels to Louvain-la-Neuve but take more time. More precisely: the station is half underground. Timetables are available on the web site of the SNCB, or by phone (+32 2 528 28 28). Brussels National Airport (Zaventem) is linked to Brussels by a train service : 4 trains/hour between 5.30 a.m. and 12 p.m. during weekdays and between 9 a.m. and 12 p.m. during week-ends. Ask for a ticket to “Louvain-la-Neuve” and get off at the station Brussels Nord (a 12-15 min. ride). Take the Brussels-Namur-Luxemburg line (trains every half hour, week-end included), get off at Ottignies (about 35 min.) and switch to a train to Louvain-la-Neuve (about 8 min.). Some trains go straight from Brussels to Louvain-la-Neuve but take more time. Bus connections are organized according to flights arrivals and departures (every half hour to Charleroi station and return). Then take the bus and go to Charleroi station. From Charleroi station, you will need to get off at Ottignies and continue to Louvain-la-Neuve. Buses from TEC serve Louvain-la-Neuve from Brussels, Ottignies, Wavre and some other surroundings. Timetables are available via TEC website or by phone (+32 10 23 53 53). turn right to the next roundabout – direction, Hocaille, Lauzelle or Blocry. at the second traffic circle – direction Hocaille, Lauzelle or Blocry.